The rate of evaporation of water surface area per meter per second or evaporation flux can be calculated by using the Irving Langmuir formula. The units is kg/m2/second. If the evaporation rate is only in units of kg/m2, not per second, then it is called as the evaporation rate. The actual formula was used by Irving Langmuir to measure vapor pressure by measuring the rate of evaporation, in this article the formula is used in reverse to determine the evaporation rate with a known vapor pressure. According to Irving Langmuir, the rate at which water molecules are lost due to evaporation into atmosphere is equal to the rate at which water vapor molecules from air hit the surface of water if it is in equilibrium. In equilibrium, evaporation rate and condensation rate will be the same. dm / dt = mass flow rate (kg) in a certain area (m-2) in one second (second, s-1), so that the unit is kg/m2/s. Pv = vapor pressure at a given temperature, or boiling point pressure at certain temperature, in units of pascal (pa). Pp = vapor partial pressure of the substance in the gas mixture, eg water vapor pressure in the air at a given temperature, in units of pascal (pa). m = molecular weight (kg / mol). R = ideal gas constant or constants Mendeleev = 8.314 Joules / (mol Kelvin). As seen in the formula, if the vapor pressure (Pv) is greater than the partial pressure (Pp), there will be evaporation. Conversely, if the partial pressure (Pp) is greater than the vapor pressure (Pv), there will be condensation. Langmuir formula does not calculate wind speed factor above water surface. Langmuir formula is using pressure and temperature parameters only, to calculate the rate of evaporation and condensation through water surface. For example, your house has a swimming pool with a water surface area of ​​100 square meters, temperature 30 degrees Celsius, the molecular weight of the swimming pool water is 0.018 kg / mol. Known air humidity is around 55%. Need to be calculated how much water evaporates every second. Vapor pressure (Pv) is also referred to as the boiling point, in which a liquid or solid substance at certain temperature will boil when given a certain pressure. Water will boil at a temperature of 30 degrees Celsius if the pressure is reduced or vacuumed, see the video here. where P is the pressure in units of Torr, and Tb is the temperature in Celsius. For the temperature 30 degrees celsius we will get log10 P is equal to 31.74 Torrs. Because the Langmuir formula vapor pressure (Pv) in units of pascal, so the value is equal to 4,231.68 pascals. To crosscheck the vapor pressure can be compared to the Boiling Point Calculator, 4128 pascal obtained results are slightly different, possibly due to rounding. Obtained from Psychrometric chart below, for air with a temperature of 30 degrees Celsius and 55% humidity, the humidity ratio obtained = x = 0.015 kg/kg' (kg water / kg dry air, or g water / g dry air). 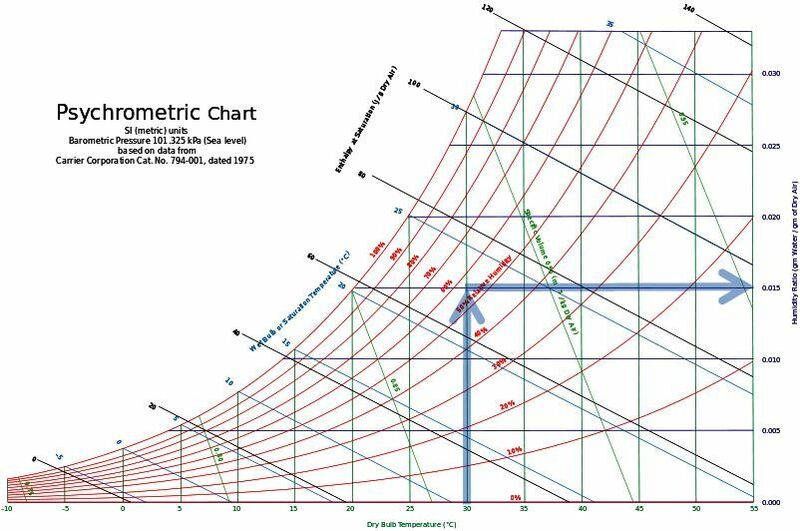 How to read the psychrometric diagram is by finding the temperature 30 degrees Celsius on the bottom, drag an arrow to the top to reach the line of 55% humidity, and drag an arrow to the right which will indicate moisture ratio (x). With a partial pressure of 2386.064 pascal, the evaporation flux will be 1.97 kgs/m2/s, this is the maximum evaporation that can occur in that condition. So as the swimming pool has water surface area of ​​100 square meters, the water will evaporate rate is 197 kgs per second. With the density of water 1kg/liter then water evaporate volume is 197 liters per second. What if the air humidity increases? Evaporation rate will be slower if the air contains moisture, or there is a partial pressure of water vapor in the air. Once water of swimming pool evaporates, the air at the surface of the pool soon becomes saturated aka humidity reaches 100%, thereby reducing the rate of evaporation to zero. If the surface of the pool in the breeze that swept humid air at the surface of the pool water, the evaporation rate will increase. When the air is saturated by water vapor, the vapor pressure of water will be equal to its partial pressure in the air, so that evaporation rate will be equal to condensation rate as revealed by Irving Langmuir. 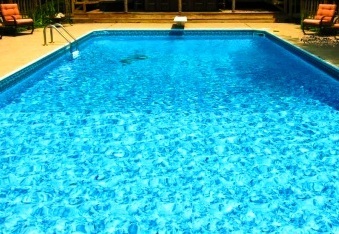 If the partial pressure greater than the vapor pressure of water, then the calculation will be negative indicating that condensation is occurring or condensation of moisture from the air into the pool, and the pool water will increase. Obvious example of this condition is in the morning, when air temperature is cool and become saturated by water vapor therefore causing condensation. What happens if the air pressure is 0 or vacuum? To broaden our perspective let's try to calculate the rate of evaporation if no atmospheric pressure alias vacuum . If the atmospheric pressure is reduced to vacuum, then the partial pressure of water vapor in the air at that point is zero aka no moisture, maximum evaporation will occur. Thus obtained the rate of evaporation per square meter per second is 4.51 kg/m2/s, this is the maximum evaporation that can occur in that vacuum condition. Evaporation will be reduced if area above water surface is filled by vapor, evaporation will be zero if area above water surface is already saturated by vapor or maximum partial pressure above water surface. Video of water boils at a temperature of about 28-30 degrees Celsius by reducing the air pressure or vacuumed, please see here.